Hi everyone!! I have had one crazy week here, so I haven't had the chance to get very creative. I do have a birthday cake that I made for my grandmother's 80th birthday. I cut the flowers, leaves, and sentiment on my Cricut Cake machine with gum paste and two of the Martha Stewart Cake art cartridges. The cake is chocolate and the frosting is butter cream. I used three 13 inch round cake pans to create this cake. 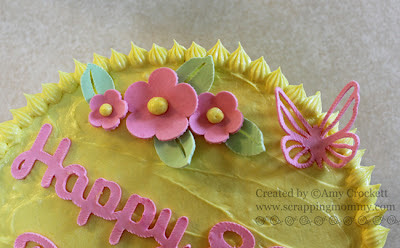 The flowers and butterfly are all molded and dried before I applied them to the cake to help them stand up a little bit. 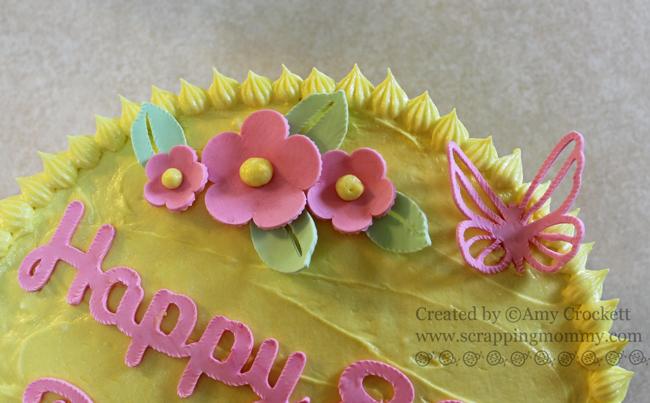 I dotted the center of the flowers with some of the left over butter cream frosting. I know that she just loved it!! My grandmother is an amazing woman and I know that most of my crafting talent comes from her. Happy Birthday Grandma!! On a sad note, I lost my beloved pet dog and best friend this last week. It has been really hard for me to get over it and I am really going to miss her.....she was my shadow and I don't feel quite the same without her following me everywhere. Her name was Cassie and she was 11 years old. Good by my SWEET friend!! 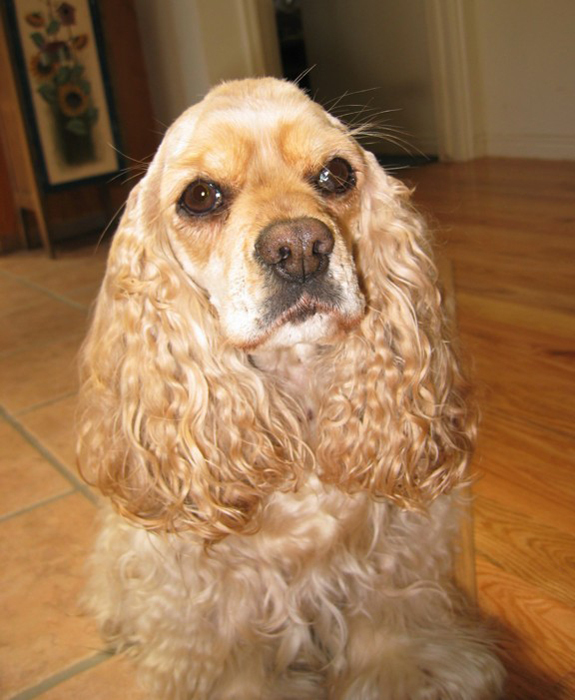 I'm sorry to hear that you lost your Cassie, my dog is also my shadow and she is getting old and I really dred the day that she is gone. A lot of people can't understand that when you lose a pet it is like losing a member of your family, this pet is with you everyday and gives you all their love no matter what. She looks like she was a beautiful dog. WOW, this cake turned out BEAUTIFUL and 80 years what an awesome birthday to celebrate. AMAZING. Amy, I'm so sorry to hear about Cassie. I know just how much a part of our families are pets become. I'm sending prayers for your comfort. 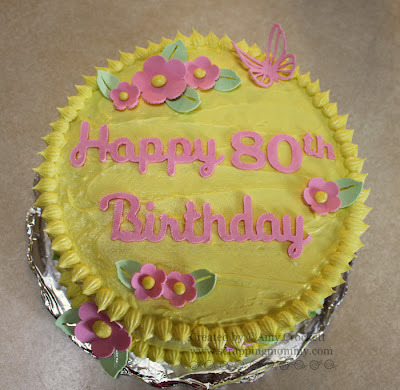 Congratulations to your Grandma on turning 80. Woo-Hoo! There's nothing quite like a Grandma. You're cake turned out beautiful. Beautiful cake, Amy!! So sorry to hear about Cassie, it really is hard to part with them. The cake looks sooo yummy!! So sorry to hear about your dog. I hope your heart feels some comfort soon. Your cake is wonderful! The best gift you could give is sharing a gift of something made with TLC! TFS and (((((hugs)))))! Amy ~ Happy Birthday to your grandma!!! The cake is BEAUTIFUL and looks so YUMMY! 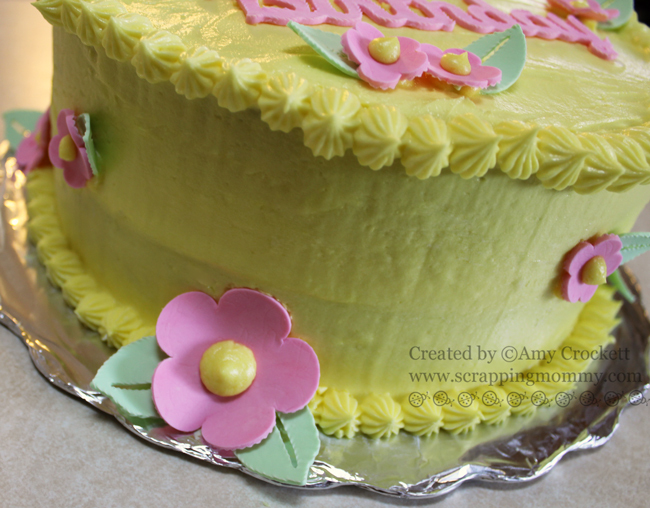 Why is it not lop sided ~ oh wait that is how MY cakes turn out! Okay onto your sweet friend! I am so sorry for your families loss! I so relate to that ~ AMAZING how they will follow you everywhere! Know she knew how much she was LOVED! My thoughts are with you and your family! HUGE HUGS coming your way! So sorry to hear about the loss of your best friend Cassie. I know exactly what your going through. I lost mine a couple of years ago and I still think of him often. Hand in there, it will get easier. Beautiful cake, can't wait to do that myself some day. What a gorgeous cake. It looks yummy. So sorry for your loss...it is so hard to ignore the huge gap when they are gone. I bet Grandma loved her beautiful cake. You did a great job on it! Oh Amy I"m so sorry to hear about your precious furry friend. We call our dog and cat our furry kids. They are surely our kids as we're old kids ourselves and those two really keep us going. They give so much love. We had to have our black cocker put to sleep 2 years ago now and I still miss her. She was such a character and went everywhere with us. We got her on a Wed. and on Saturday hubs, her and I left on a few weeks trucking trip. She was such a hoot in that truck. The mischief she got into. She was a little over 14 when she died. It's so hard, I know. I don't remember if I left you a condolence but I'm doing so now. It takes awhile to get used to not having them. It took me months before I was able to even think about getting another dog. You'll have so many wonderful if hurtful memories of her but cherish them. They only get to be in our lives for such a short time. She looks like such a sweetie. So sorry to hear about your beautiful sweet Cassie. She looks like such a sweet dog. It is amazing how they become such a big part of our lives-take care Amy...sending prayers and hugs your way. 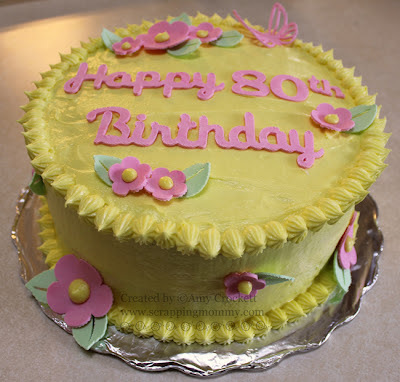 Your cake is just beautiful that your made for your Grandma. It looks so pretty with the flowers. Nice job!